We all have something that scares us, whether it be approaching a gorgeous stranger or sharing an exciting idea at work, but it can be incredibly frustrating to feel as though we’re stuck just out of arms reach of the things we want. Today, we’re going to cover three ways to avoid the freezing phenomenon altogether so that you can get out there and take action. What is it that typically happens to you when you are “freezing up”? Does your throat tighten? Does your body get tense? Does your mind go blank? Do you generally spaz out? Before we get into the three tactics we can use to avoid these results, it’s important that we first discuss how we accidentally perpetuate this cycle. When we try to talk to someone about our freezing problem, we usually say something like “I can’t/couldn’t do anything” or “I couldn’t move/speak/think at all.” Have you ever said that to yourself or someone else? Here’s the thing: every time you say “can’t” or “couldn’t,” you are making it that much harder to succeed at the thing you are trying to accomplish. This is a language trick that we play on ourselves . . . when you freeze up, is there a medical or genetic condition that physically prevents you from being able to speak or take action? No. The truth is that you can take action, but you choose not to—you don’t want to feel the discomfort of being rejected or embarrassed so you allow yourself to be held back. Like it or not, we believe the things we tell ourselves, and you’ve got to pay attention to the words you use, because “I can’t” is not actually accurate. We need to start this journey by adjusting our language. We need to speak the truth to ourselves: “I could have, but I didn’t. I chose not to because I didn’t want to feel discomfort.” Until you do this, you are allowing yourself to believe that you are not in control of the situation. This is the only way to put yourself back into a place of power and ownership in your life. Now that we’ve got that covered, let’s dive into the three things we can do to keep ourselves from ever freezing up again! The first thing you have to do start gradually—work your way up to the tough stuff. Let’s say you see three beautiful women sitting in a coffee shop and you want to talk to them. Let’s be honest . . . that would be hard for anyone to do! There aren’t too many guys in the world, in fact, who would be able to do that with absolute confidence. What we want to do is start small. We need to build up our social “muscle” before jumping into the really scary stuff. No matter what your desire, find the smallest way to stretch outside your comfort zone, and do that for a couple of weeks. If you want to start dating and jumping into relationships, start by simply saying “Hi” to people. Try greeting attractive women as you walk by them on a daily basis. They often don’t respond because they’re like, “What does this guy want,” but that’s fine—it’s all part of the practice of getting comfortable with whatever responses that you get. The same goes in a work setting: if you’re afraid of speaking up in the conference room, try establishing yourself as a game-changer on a smaller scale by sharing your ideas with one or two colleagues. While it’s still a bit of a challenge, it will help you to build up to the big stuff. Eventually, the three women in the coffee shop and that presentation in front of the VIPs will look like small potatoes. The second thing you have to do is learn how to activate your power. So many people shuffle around tensely with their heads slumped forward, allowing their bodies and voices to shrink. Can you picture this posture? It doesn’t look (or feel) very powerful. If we can activate the power in our bodies, we can step up and look any situation in the face; we can send our power outward and allow it to fuel us into action. This is actually something I spend a lot of time on in my module, Confidence Unleashed. This is a program you’ll want to check out if you’re interested in diving into body activation at a level you’ve never imagined. 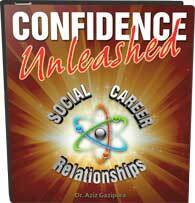 One simple way you can start to activate your power even before checking out Confidence Unleashed is by using outside stimulation: in the morning, put on a song that gets you pumped up; let it play for three minutes and walk around your house making noise and feeling that activated sense of power. Electronic music is great for this, but whatever speaks to you is best: rock, metal, even country music—whatever you like! It’s important that you use your body and your voice as your activate your power. Make noise, jump up and down, pump your fists—research shows that these activities can affect physiological changes in the body, and you’ll be amazed at how it can transform your energy for the rest of the day. The third thing you need to do is to commit. You must decide that no matter what happens, you’re going to stick with it. When we place importance on an action, we have a tendency to beat ourselves up after seeing less than desirable results. In this third step, you’re making a promise that you’re not going to attack yourself for making a mistake. When you commit to compassion no matter what, you’ll be amazed at how much more rapidly you grow. Please feel free to share, like or subscribe below. Share how these techniques have worked for you and what you’ve learned so that we can all learn from each other and help each other succeed. 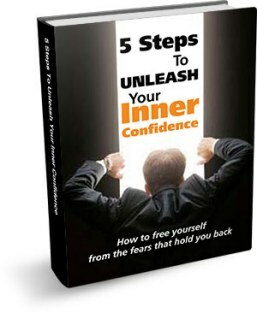 If you want to take these techniques to the next level, go to ConfidenceUnleashedNow.com and get started with a free eBook! Hi Aziz, it’s always fun to listen to you. Although you speak mainly to guys, it is also interesting (and educational) for “elderly ladies”. Insecurity is not only a problem for the young ones.